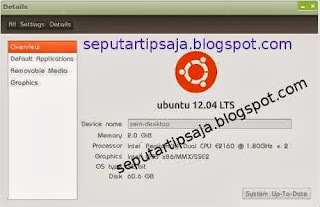 As has been mentioned on the official ubuntu website that in order to know the version of ubuntu Linux used in computer or laptop can be done in two ways, we can use detail in system setting or terminal by typing the command text and will be available there appearance ubuntu version installed. Its essence if we are going to install an application on the terminal with don't know ubuntu version this Will be problem and then we searching an application in search engine like google, once we know if the application is there and it's just a coincidence version of the application can be used for example ubuntu 12, now from here maybe we start to think if we forget our Linux version because it can be different versions of ubuntu for example there will be different apps version on ubuntu 12.04 and ubuntu 12.10 . So we pre- download apps that we use is useful to know the version of ubuntu Linux so that we use when install the application does not encounter an error or failure, because the version of the software that we use in different versions of ubuntu it normally would not be able to do will fail in the installation. Linux operating system is an operating system that can be used for a variety of technology and so easy if we've learned a little about it. Even if we know that the linux operating system can change in a variety of other operating systems are different. Even android is basically an operating system derived from Linux. For that in contemporary times and we should be able to understand with Linux. In addition to the free license or a Open GPL can we update in accordance with what we want. I hope in this tip can help to determine the version of ubuntu and the kernel. That way we can instantly locate the application or software in accordance with the ubuntu version used. Is it important? Yes of course be important because as I was said in the beginning that if we are going to install an application the application in question must be in accordance with the ubuntu version. 1 . The first way is by clicking on the button settings can search in the upper right near the shutdown button or can we find on search applications by typing the word "System setting " without the quotes . - To find out what version of ubuntu in the terminal typing "lsb_release-a" (without the quotes) and "enter" the keyboard it will exit the output of ubuntu version used as in the picture below. 3. How to know the version of the kernel used in Ubuntu is by typing "uname-r" or "uname-a" in terminal ubuntu. If there are mistakes please forgive and hopefully useful and increase knowledge for me and also for the reader.